Minister, long terms vision and current situation of the Indian Economy. society, no commitments for GST implementation, triple taxation on Dividend. – Growth of Economy accelerated to 7.6% in 2015-16. – Foreign exchange reserves touched highest ever level of about 350 billion US dollars. – Giving a statutory backing to AADHAR platform to ensure benefits reach the deserving. – Allocation for Agriculture and Farmers’ welfare is Rs. 35,984 crore. manure will be taken up under MGNREGA. – Soil Health Card scheme will cover all 14 crore farm holdings by March 2017. 65,000 eligible habitations by 2019. – Allocation for rural sector Rs. 87,765 crore. 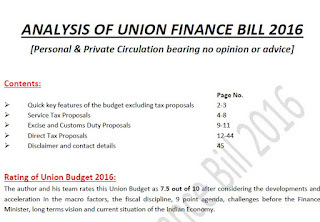 recommendations of the 14th Finance Commission. – 100% village electrification by 1st May, 2018. – Allocation for social sector including education and health care Rs. 1,51,581 crore. – 62 new Navodaya Vidyalayas will be opened. setup in partnership with the industry and academia. statutory audit under the Act. – 100 Model Career Centres to operational by the end of 2016-17 under National Career Service. – Total investment in the road sector, including PMGSY allocation, would be Rs. 97,000 crore during 2016-17.
through bonds. Total outlay for infrastructure Rs. 2,21,246 crore. – Allocation of Rs. 25,000 crore towards re capitalization of Public Sector Banks. 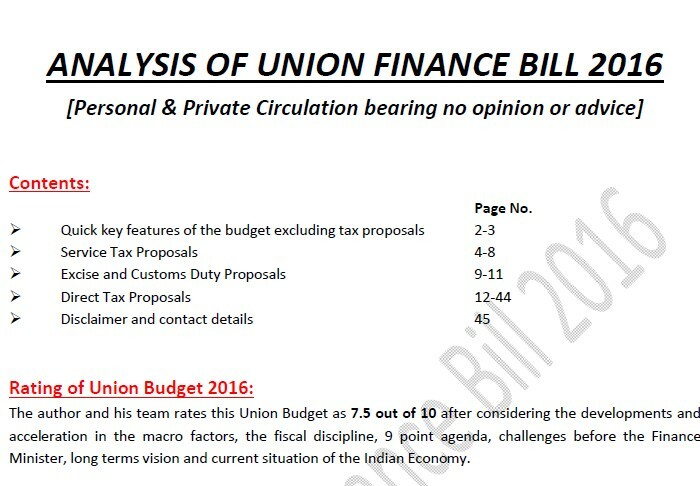 – Fiscal deficit in RE 2015-16 and BE 2016-17 retained at 3.9% and 3.5%. – Revenue Deficit target from 2.8% to 2.5% in RE 2015-16. Pension Scheme (NPS). Annuity fund which goes to legal heir will not be taxable. – Committed to providing a stable and predictable taxation regime and reduce black money. – Expansion in the scope of e-assessments to all assessees in 7 mega cities in the coming years. – ‘e-Sahyog’ to be expanded to reduce compliance cost, especially for small taxpayers. having income above Rs. 1 Crore. – No change in tax rates for individuals, co-operative societies, firms, local authorities and companies. – 10% rate of tax on income from patent developed and registered in India by a resident. – Under NPS, withdrawal upto 40% of corpus is tax exempt. – Under superannuation funds, RPF including EPF, upto 40% of corpus to be tax free. – Deduction of rent paid u/s 80GG increased to Rs. 60,000/- per annum. – Raising the ceiling of tax rebate u/s 87A to Rs. 5,000/-. – Introduction of Direct tax dispute resolution scheme 2016. – Introduction of Income Declaration Scheme 2016. – Krishi Kalyan cess @ 0.50% on all taxable service w.e.f. 01.06.2016.